She is best known for her signature designs in beautiful patterns of flower and fruit, often with a quirky surreal twist to make you smile. Her textiles have been used extensively for fashion and furnishing, with a favourite outlet being the iconic Liberty's in Central London. Her work is in the permanent collection of The Victoria and Albert Museum. She has taught and lectured at art and design schools and in pop up venues across London. 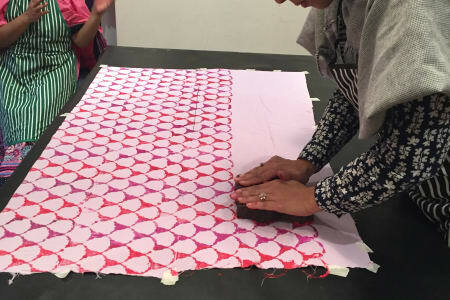 The workshops held at her home studio are taught with the ethos of teaching for the joy of learning, using salvaged and upcycled materials from the textile industry. Susannah was a great teacher- she took the time to explain/ guide us individually if needed and shared her large knowledge about the practice of block printing. I would definitely recommend the workshop- I am looking forward to continue the practice and to get more creative! Fantastic way to learn even if you dont think you are naturally creative. susannah has a way of drawing it out of you whilst keeping it fun and met some lovely people. Excellent workshop. Susannah was lovely and so welcoming, and really knowledgeable. I went with my mum and we both thoroughly enjoyed our afternoon. It was really relaxing and a great opportunity to get creative! A fun and relaxed way to get creative whilst meeting new people and having a cuppa and a chat. 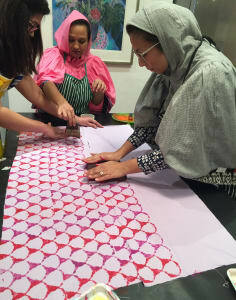 Susannah is a lovely host and made sure everyone got the most out of the workshop with useful tips and guidance. I especially love the bag I printed! I really enjoyed the workshop. We were warmly welcomed by susannah and made to feel very relaxed and comfortable. The blocks we used for printing are absolutely gorgeous and I was very pleased with the end result, I printed a cushion cover, a bag and some material. Susannah was extremely helpful and explained everything very clearly.